The Little Fabric Blog: Half Hexi Quilt + A GIVEAWAY! 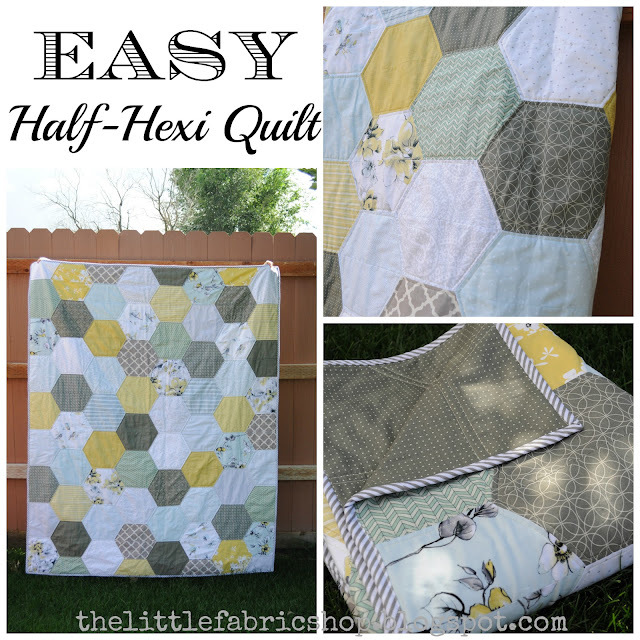 Half Hexi Quilt + A GIVEAWAY! I am so excited to FINALLY share this quilt with you all! I made it back in June, but haven't time to finish it until now, silly moving! I made it specifically for my master bedroom and I knew that the Paloma Collection was the perfect choice! I think my favorite part is the binding! And the backing is so cute too! It's from the Comma Collection. My extremely talented friend Rhonda did the quilting again. Just simple, but so fantastic! This quilt was SUPER EASY! 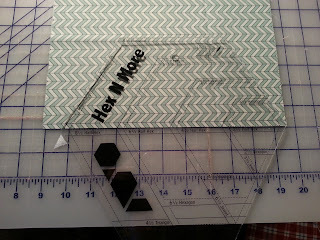 I folded a 10" square in half, and then used my Hex N More Ruler to cut out two half hexies at once! And sewed them together one row at a time. All straight lines, and no corners! 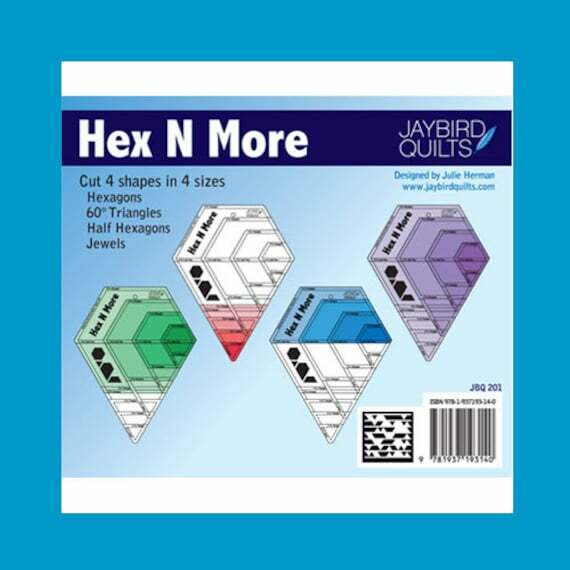 WOULD YOU LIKE TO WIN A HEX N MORE RULER OF YOUR VERY OWN? The possibilities with this Ruler are ENDLESS! Jaybird Quilts has designed this fabulous ruler and you can head over to their site for more inspiration and ideas! a $20 Gift Card to the Shop! *Just leave a comment here on the blog telling me what you would make with your Hex N More. just share our GIVEAWAY POST. GIVEAWAY ENDS THURSDAY, SEPTEMBER 19th at Midnight! The winner will be announced here and on our FACEBOOK PAGE. Then you will be on your way to getting all the stuff needed to make your own Hexi Quilt! I would make a hexi quilt just like yours. Adorable! I would make a quilt. Yours is so beautiful! I would make a quilt like yours, I just LOVE it! HELLO,I think I'd make a quilt similar to yours in shades of Aqua! Thanks so for sharing a neat tool! I'd make a hexi quilt for my new nursery! 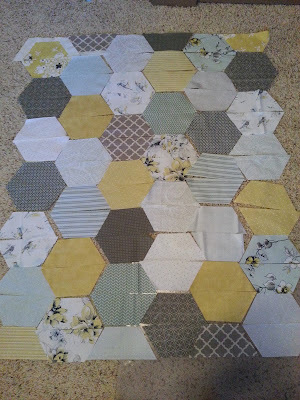 I would make a Honeycomb lap sized quilt...with a few added bee appliques! I want to copy your quilt...it is fabulous! I would make a quilt just like this one! Beautiful! I love that quilt! I'm new to quilting and haven't tried a hexie yet. Now, I have the bug and you made it look so easy. That ruler would be a great tool. Thanks for the giveaway! Love that quilt and the colors! I would attempt to make a quilt and try to impress my mama! I have just started to get into sewing after many years of her urging me to! I would totally make a quilt!! I am up for the adventure! I would be making my niece a baby quilt! I'm just loving the oversize design of your hexie quilt so I would love to try one for myself. The tool really makes it look doable for a novice like me! I would make the hexie quilt you did. I LOVE the Paloma collection-- beautiful choice for your new bedroom! i would LOVE to finally make my own quilt:) never done one, but have been meaning to for a loooong time! whoops! wasn't logged in last time i left this comment. i would LOVE to finally make my own quilt:) never done one, but have been meaning to for a loooong time! Sweet! I'd love to make a hexie quilt but not such a fan of hand sewing. This seems like a great alternative. Baby quilts are my thing so I would make a baby quilt in pretty pastels! I pinned to my quilts board on Pintrest, and shared your quilt on both of my facebook pages. Thanks. A quilt or a cute bag would be awesome. These are pretty cool. I would make a baby quilt. I always like to have several in my arsenal for instant baby gifts when needed! I'd have to make those pillows in Jaybirds pictures! Love your quilt! I have some charm packs that would make a nice half-hexie quilt. Thanks for the chance to win. I would make quilts for the Ronald McDonald House who took such good care of us when our two grandchildren were ill. I think I would make the Little Dancer in bold colours for the children. I would make this quilt for sure! I love your quilt, wonderful colors. I love hexies, they are so fun. Would love to win a ruler. Thanks! The question is what WON'T I make??? Seriously, I have always loved hexie quilts so I would have to answer with that. Thank you! I would love to make my own large hexi quilt. Thanks for the chance. Found u through Pinterest and so glad I did. Totally pinned it. However since I am on my tablet using my ipad app I can't figure out how to share the link. I would make a quilt for my son's new "big boy" bed! Am in the middle of my first hexie project, am using the hand sewn method. Would love your tool to make it your way and the sort of Christmas tree shape looking pattern you have above as well. Your tool looks fantastic and much easier and quicker. I would love to sew a hexie pillow! I want to make throw pillows with Large Hexi's! I'd duplicate your quilt for starters, then I'd have to figure out what else that sweet ruler can do! :) Thanks for the chance to win; your quilt is great! I love your hexie quilt and would start with that and then hopefully expand to many more wonderful projects. Thanks for the inspiration! I have not made a Hexi quilt yet and I am going to do one soon..I think one for each season would be cool! I did pin the give away on my quilt board on pinterst and am heading to FB now to let all my friends know about it!! Cool!! Thanks for the opportunity and if it does not come my way, I will still be buying that ruler soon...Thanks so much!! I would love to make a hexi quilt but also a triangle quilt. I love all of the possibilities in one ruler! Love this quilt - especially the calm colors to it. Of course I had to pin this quilt - it is a must for a future quilt! Oh I love this! 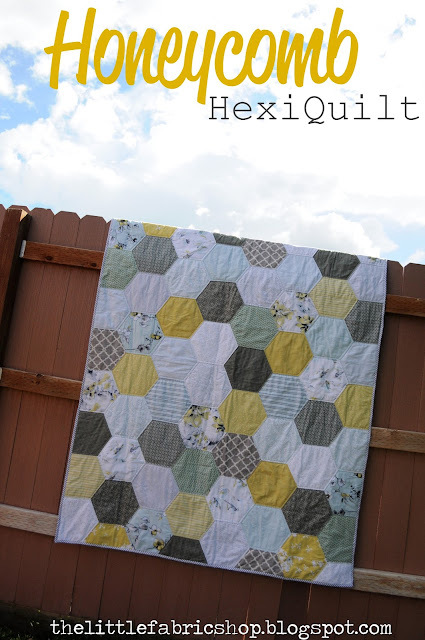 I am a beginning quilter and I have been wanting to try a hexie but I have heard how difficult they are. This seams (misspelled purposely lol) like an easy method! I have a collection of Amy Butler fabrics that I would use to make a quilt with. I just love this quilt! I'd love to make one similar - specially seeing how easy it is with half hexies! I would happily make some half Henie floor pillows. I would make a baby or childs with it, it would be soo cute! I would make a hexi crib quilt for my sweet little man! Pinned on pinterest! That's how I found your giveaway too! I would make a beautiful quilt for my bedroom,just like yours! I have been dying to try something with hexies! Love the Hexi! My oldest daughter would just love it. Would love to make an easy half hexi quilt! ... yours is gorgeous! I would make a hexi quilt just like yours! I would love to make a hexi quilt like yours! I pinned yours! 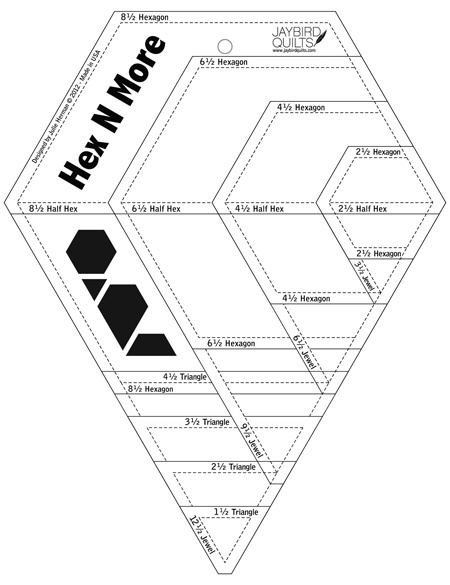 Would love to make one of the half-hexi quilts with the Hex-n-More. Hoping I can win it and try it out. I would definitely make one just like yours. I love hexagons! Hey there! How big are your hexagons on this quilt? I love the colors and want to try my hand at making one of my own. Also, have you ever seen a hexagon quilt with less repeating patterns? I ask because I'd like to make one using clothes that my 5 month old has out grown. I like her in certain colors so there would be some symmetry in that, but you can't get many hexis out of a newborn onsie! Thanks for your help! New Fabric Friday & A WINNER! 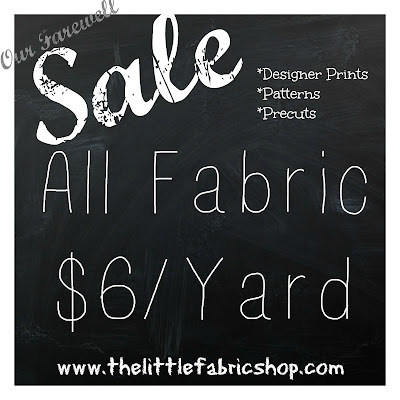 New Fabric Friday & Sale!